The term "Marché aux puces" literally translates to-- you guessed it-- "flea market". The largest Paris flea market, located in St. Ouen, was established around 1870, earning its name because of the ostensibly flea-infested furniture and other wares sold at the market just outside of the city's northern fortifications. Years later, Pablo Picasso used the markets for walks of inspiration, and more recently, Woody Allen's popular film "Midnight in Paris" sent its characters here searching for hidden treasures at bargain prices. Claiming to be the largest of its kind in the world, the St. Ouen Flea Market attracts more than 11 million visitors per year and boasts over 2,500 stalls ranging from antiques to fashion, minus the fleas of old, luckily. In addition to this most famous of the "puces", Paris counts several other fascinating markets to peruse and stroll. The possibilities for eccentric finds are nearly endless: you might happen upon old, charming ​knickknacks, records, clothes, books, eccentric quills or prized antique items. It's one of the free Paris attractions that the budget-minded traveler should definitely add to their itinerary. Address: Get off at Metro Porte de Clingancourt (line 4) and follow the signs to the market. The market lies between Paris' 18th arrondissement (district) and the northern suburb of St Ouen. Hours: Open Saturday, 9am to 6pm, Sunday 10am to 6pm, and Monday, 11am to 5pm. Entry is free. Looking for another perfect market to spend a morning or afternoon roaming? Below is a list of the most popular non-food markets in Paris, aside from the aforementioned one at Clignancourt. Most of these markets are open only on the weekends and sometimes on Mondays, so make sure to set aside time for a whirl at one of these excellent "puces". Hours: Open: Every weekend all year long, 7am to 2pm. Entry is free. Hours: Open: Every weekend, 9am to 6pm. Entry is free. Hours: Open Saturday to Monday, 7am to 7:30pm. Entry is free. Taking a stroll around the old flea markets is always a lot of fun: but make sure you do it right, and avoid unpleasant experiences like pickpocketing and, less seriously, finding yourself short on cash just when you find that dream antique! Related: How to Handle Money and Payments in Paris? Get cash out. The first thing to do before jumping into the flea market fray is to stop at an ATM/cashpoint. There are no credit or debit card transactions at the stalls, so make sure you have enough cash on you before you begin shopping. Get there early. Be prepared to get to the markets near opening time, so that you don't miss out on items that are quick to sell, such as unique porcelain decorative items, old photographs, and military paraphernalia. Be wary of pickpockets. Make sure to keep your wallet and other valuables out of easy reach, as the crowded conditions at the market are ideal for pickpocketers. You might want to see our guide to avoiding pickpockets in Paris before hitting the markets to ensure you learn thieves' tricks in advance. Don't be afraid to dig and sift. It's not impolite to do this-- don't worry. Many flea market stalls resemble rooms in a hoarder's house: to find the good stuff, you sometimes have to sift through heaping piles of uninteresting items. Consider it an amusing treasure hunt and a challenge-- and certainly don't feel embarrassed about it! Your fellow market-goers will likely be impressed to see you home in on something interesting. New to the Parisian flea market scene and looking for something a little less overwhelming than the monstrous Puces de St Ouen to begin my experience, I decided to start at the Marché aux Puces de la Porte de Vanves one Sunday morning to browse through 350 stalls of furniture, trinkets, paintings, jewelry, and other unique goodies in the south of Paris. I next made my way over to the Marché du Livre Ancien et d'Occasion (Old and Secondhand Book Market) in search of rare and old books. 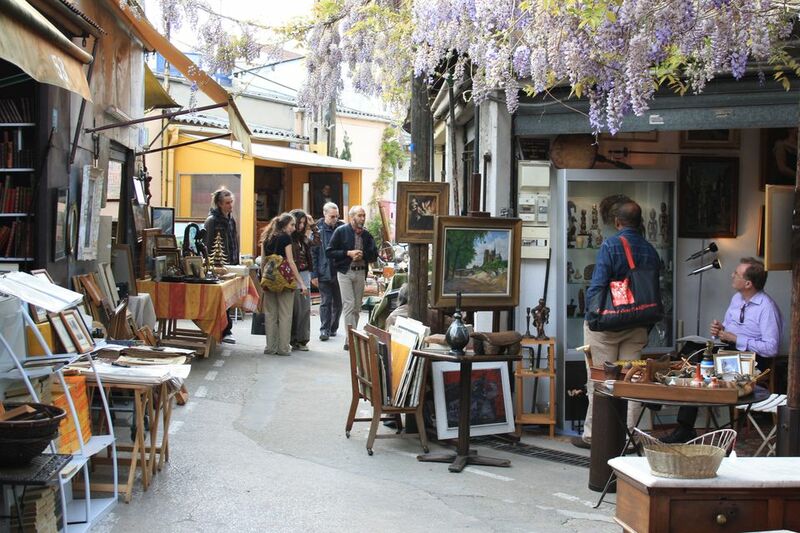 Flea markets in Paris attract both Parisians and tourists alike. Though you may have dressed the part to not be seen as a vacationer, the vendors will be able to see right through your disguise and try to take advantage of you when it comes to asking for the price of an item. While looking over a potential purchase, first determine to yourself how much you'd be willing to spend on the item before asking for the price. You may be pleasantly surprised, but chances are you will likely have to bargain with your vendor. After doing my best work, I found that the majority will go down a few euros, while others will not budge. I initially headed to the flea market at Vanves looking for a unique birthday gift for a friend. In between admiring Marie Antoinette porcelain salt and pepper shakers (pictured on this page) and tin cans dating from World War II that would make for terrific decorative items, I came across something for myself that I had never seen before. Throughout Paris, sellers along the Seine and various stores and markets feature old postcards dating back over 100 years. As my fiancé and I have begun planning our wedding, we decided to use such postcards as our "save the date"cards. Within the mess of a crowded table at the Marché aux Puces de la Porte de Vanves, I stumbled across complete (and unused!) postcard books depicting the likes of Henri IX's Chateaux, summer beach vacations, and the Paris of old. I was able to come away with 60 post cards that normally cost €2-3 each for a total of €37. It was an incredible rush! After this experience, I have one strong piece of advice: You may be on the hunt for one thing, but keep your eyes open, as you may hit on unexpected treasures. The flea markets in Paris often feature a festive air of community. At the Puces de Vanves, I watched two men play an old board game that was set up for testing (pictured), another put change into an art deco slot machine in hopes of securing the prized three cherries in a row, and an elderly blind man pound away on a piano.